I had a slight panic attack this morning when a spider decided it wanted to hang out with me in my car as I was driving down the highway to get to work. I'm OK when the car isn't moving but when I'm going 70+ MPH I somehow forget normal brain functions and instead my only thoughts are holy crap don't crash a spider is in here how do I get it out what do I do I don't want to die! It may have just wanted to drive since it was headed towards my steering wheel but for obvious reasons that wasn't happening. But mostly because I wanted to kill it. So, rather than killing the spider with one of the many napkins or receipts in the center console, I decided in my moment of panic that the best thing to do would be to fling it away from me to the passenger side of the car. This creates another issue. Now I know there is a spider somewhere in my car that is alive and probably wants to seek revenge. I mean, I probably killed it's dream of driving a car or something, but I have my reasons. But since spiders don't understand rational thought I had better check to make sure my break lines aren't cut or anything before I leave work today. And then when I actually stopped the car to look for it, I found myself whispering as I looked over at the passenger side of the car "come out so I can kill you". I realized after I said it how creepy that actually was and the whispering made it worse, I think. But I truly meant it. 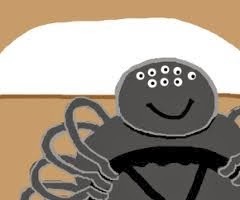 Please show yourself, spider, before I start driving again. I won't feel at ease until I either find and kill it or the weather drops below freezing and I can assume it froze to death. Either is acceptable but I would prefer sooner rather than later. Or maybe I'll just buy a new car and never drive that one again. Or since it's winter I'll invest in sled dogs. Or a snowmobile? Those options will be cold but at least there won't be spiders. P.S. Want to know why I hate spiders so much? This is part of it. Also, because it's normal and people who aren't grossed out by spiders worry me. Happy Thanksgiving, I'm Scared To Go Out! Out Of The House... For Shopping!